Late last week, Bhagwan Chowdhry, a Professor of Finance at UCLA, wrote a piece on HuffPo suggesting that he would nominate Satoshi Nakamoto for the 2016 Nobel Prize in Economic Sciences. (Technically: The Sveriges Riksbank Prize in Economic Sciences in Memory of Alfred Nobel. 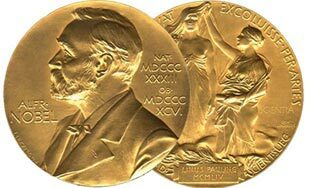 The Prize in Economic Sciences is not a Nobel Prize.) This is actually not as unlikely as it might first appear; nominations to the Economics Prize are by invitation only, and Professor Chowdhry has been invited to make a nomination for 2016. What’s even more interesting to me is Professor Chowdhry’s comment in an interview on CBC Radio last night that, after his blog was posted, he heard from several colleagues, none of whom he knew was even interested in bitcoin. They agreed with him about the magnitude of the innovation brought about by bitcoin and decentralized ledgers and the merit of the prize going to Nakamoto. Professor Chowdhry says there are more people than we think who believe this is a game-changer. Of course, people have asked how to award the prize to someone or to a group that is anonymous and wishes to remain so and how to pay the prize money (easy, says Professor Chowdhry: send bitcoins to a Satoshi address). But those seem like side issues. Some in the cryptocurrency space may abhor the idea of such recognition. It cuts against its disruptive reputation. Bitcoin doesn’t need the imprimatur of the Swedish Academy of Sciences or anyone else; it’s just a better way of expressing, tokenizing, storing, and sending rights and assets. Full stop. And Paul Krugman, a Nobel Laureate himself, is a huge naysayer where bitcoin’s concerned. Who wants the recognition of a body giving awards to deniers? (Not sceptics: deniers). But, then again: why not? I think it’s a great idea. No, bitcoin doesn’t need it. Cryptocurrencies writ large don’t need it. The technology will move forward and evolve with or without the economy of prestige. But there’s nothing at all wrong with having these developments recognized and celebrated by everyone. And anyone who hates that Krugman received a prize might take comfort from von Hayek and Friedman having also received them. The prize highlights scientific achievements in the field of economics. Bitcoin appears to tick all of the boxes in a number of fields, economics included, which isn’t to say there aren’t other deserving nominees. But why shouldn’t Nakamoto—whoever and wherever she is or they are—at least be nominated? Maybe the most interesting thing here is Professor Chowdhry’s elegant expression of what a great many of us already believe about decentralized ledgers: that there has not been another innovation in the last few decades that is going to have as big an influence on the way we think about money, contracts, and trust in society.